Do you like Stuffed Peppers? and a little bit of a Mexican flavor? If so, you will LOVE this recipe! I found it one day because I needed a really *easy* recipe and this is just that! But it has so much flavor and really is delicious that I thought I would share it with you!! It has a great kick to it and my hubby and I could eat it every week. 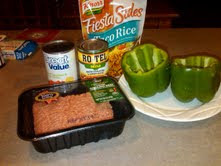 We love stuffed peppers and mexican food so it is the best of both worlds. Another perk is if you are only cooking for 2, this makes a TON of leftovers (depending on how many peppers you decide to make) and you can use the extra mix to put in tortilla shells! -Cut off tops of peppers and remove seeds. In a dutch oven (a tall saucepan on the stove works too), cook peppers in boiling water for 3-5 minutes. Drain and rinse in cold water; set aside. 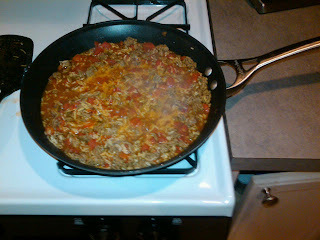 -In a large skillet, cook beef over medium heat until no longer pink; drain. Add the diced tomatoes, water, and pasta mix. Bring to a boil. Reduce heat; cover and simmer for 6-8 minutes or until liquid is absorbed. 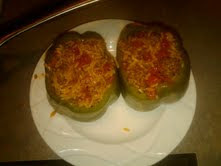 -Place 1/3 cup rice mixture in each pepper; sprinkle each with cheese. Top with remaining rice mixture. Place in a greased 13x9 baking dish. Cover and bake at 375° for 25 minutes (mine are usually done around 20 minutes). Sprinkle with remaining cheese; bake 5 minutes longer or until the cheese is melted and peppers are tender. Oh my goodness - I love Mexican food and those look delicious! Thanks for sharing. You should definitely check out at CrossFit in your area. Most gyms offer free claasses on Saturdays so you can try a class and see if you like it or think it will be worth it to you. It's truly been such an inspiration to me over the past three months! Hey there! I just had a question.. I see it calls for one can of tomatoes & green chilies but there are 2 cans there. Is one tomatoes and one green chilies? Just a little confused. :) Thanks so much!